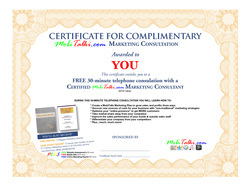 "How to Use Google+ for Business"
A Certificate for a Complimentary "Optimization Consultation"
A 30-minute review with one of MobiTalki's "Inbound Marketing" experts. He will review your website's "Optimization Report" and discuss with you how to 'mobilize' your business and get more positive business reviews. Learn More About MobiTalki's "Optimization" strategies for your online assets to get more customers at LESS cost. What your different options are for "getting new customers"
After a consultation is scheduled we will conduct our "Optimization Review" and send you a copies of the reports prior to the Consultation. Our Inbound Marketing expert will provide you with advice that you can implement immediately; and, in addition, share with you how MobiTalki can help you grow traffic, leads and sales with your 'optimized' online assets...all things Local, Social & Mobile!